Waves Announces Increased Popularity of SoundGrid® On DiGiCo SD7 and SD10 Consoles in the U.S. Waves is a leading provider of audio DSP solutions for professional, broadcast, and consumer electronics audio markets. Waves has ten years of expertise in the development of psycho-acoustic signal processing algorithms that leverage knowledge on the human perception of hearing to radically improve perceived sound quality. 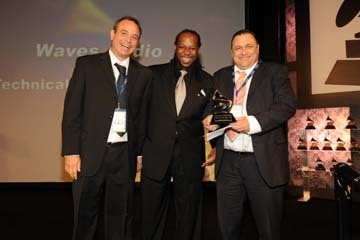 Waves’ award-winning processors are utilized to improve sound quality in the creation of the world’s most popular music, movie soundtracks, and multimedia titles. Waves offers computer software solutions and hardware plus software solutions for the professional and broadcast markets. Waves also offers semiconductor with embedded software solutions under the Maxx brand for the consumer electronics audio applications. Waves’ Maxx technology dramatically enhances audio performance in consumer applications and has been licensed to several leading companies, including Motorola and Microsoft. For more information, visit the Waves web site at http://www.waves.com.